Engaging with your customers while online is a crucial element to digital marketing. It can not only boost awareness of your brand but also encourage repeat business from existing customers. We find that one of the best online platforms to engage with customers or clients is through social media. Now, we know that one of the most obvious ways to engage with customers is through responding to questions and complaints, but when it comes to social media, creativity is essential to get users to engage. After all, this isn’t your grandmother’s social media (unless she’s a social media wizard…). Because of the way that audiences use social media and consume content, not to mention the number of brands who are trying to get their marketing message out there, it can be difficult to encourage social media users to interact with your posts. If we’re being totally realistic, we all follow at least a few companies or brands on social – and we don’t always engage with them. So, as a brand or business, when you’re posting on social media you’re ultimately fighting for space on the feeds of your users, along with every other brand they follow. This makes using creative methods of engaging with your customers even more crucial to your social strategy. But don’t worry, we’re here to help. 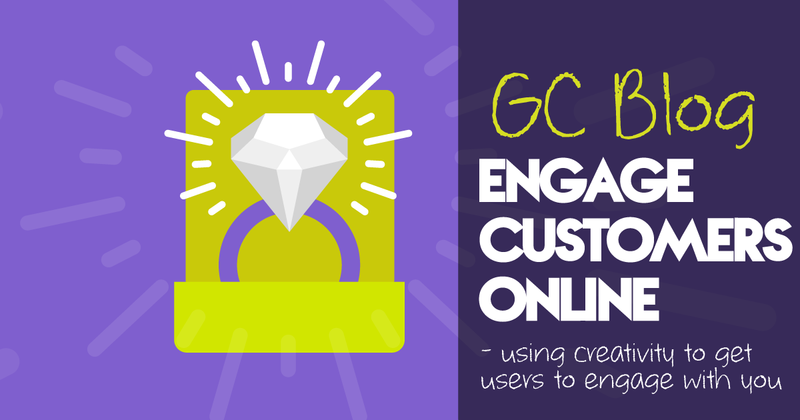 Here are our favourite ways to prompt engagement with customers through social media! Social media is largely made up of opinions. “This is what I think of this news article”, “I loved this movie”, “I can’t stand this music artist”, “I think that this celebrity is so brave” and “This is my favourite ___” are just a few that come to mind. That’s why, when you’re actively asking users for their opinions – especially through a format like polls – you’re much more likely to get engagement. One of the most beneficial aspects of polls is that they’re available to use on a variety of social platforms, such as Instagram Stories, Facebook posts, and tweets on Twitter. Polls can also be used in different contexts. This could be allowing users to contribute to your business or brand, such as offering options for what your next product/service could be, or to make internal decisions, like what the new names for meeting rooms should be. This offers users a way to connect with your brand in a way that isn’t solely based around products or services, but more on a personal level. Polls can also be used for general conversation around topical and relevant news – for example, asking whether new changes being made by tech companies will impact them. Conversation starters are one of the biggest ways to interact with users online, as you’re offering people the opportunity to contribute to a conversation. Conversation starters also allow users to provide their opinions as well as their own experiences, not to mention the opportunity to interact with someone – whether that’s the brand or even another like-minded user! We’ve included some of our favourite conversation starters below. When writing a social post, including a question directed towards your users is a great way to get the conversation flowing. For example, we recently posted about our new blog ‘what are memes and can they help my online presence?’ on Facebook and Twitter, and at the end of the post, we asked users to share their favourite meme in the comments – keeping the conversation going. Another way to encourage engagement is providing users with a problem that they can solve (ideally with a prize at the end!). Our sister brand, Sleeping Giant Media, recently ran a Christmas campaign called Giant Elf, which incorporated a puzzle – asking users how many ball pit balls there were in a video. As a result, users submitted plenty of entries, creating some healthy competition and getting people talking – while also meaning that we received some lovely engagement! GIFs are great for responding to… well, most things really. After all, pictures can say 1,000 words! The right GIF can explain exactly how you’re feeling, which is why they’re such a great tool for conversations on social media. We often ask users to tell us their opinion, thoughts or even how their day is going through a GIF. We do this because it’s a fun, interactive and creative way to prompt users to contribute to the conversation. Ultimately, customer engagement is all about the emotional connection between your customers and you, bringing them closer to your brand. Customers who are engaged with are much more likely to purchase your products or services, promote your products or services to other potential customers, and above all, exhibit loyalty to you and your brand. By providing your customers with high-quality customer experience, you’re solidifying a crucial component in your brand’s customer engagement strategy. Still not got your fill of learning how to utilise social media? Check out our blog ‘ffs, stop trying to cheat social media’, or our blog on ‘The dark and light side of social media’ to learn more about how you can effectively use social media in your digital marketing strategy! If you want to learn more about using social to your advantage, book a slot on our Social Animal course, where you can learn how to implement strategies and use all social platforms to achieve your business goals. Sign up today!